"Here is a Thai vegetable side dish with plenty of Chinese influences. Utilize whatever mushrooms are in season, such as straw, button, het kone or shiitake mushrooms." Heat the oil in a large skillet or wok over medium heat; cook the garlic in the hot oil until browned, 5 to 7 minutes. Add the onion and baby corn and cook until the onion is translucent, 5 to 7 minutes. Add the mushrooms to the mixture and cook until slightly softened, about 2 minutes. Pour the fish sauce, soy sauce, and oyster sauce into the mixture and stir until incorporated. Whisk the cornstarch and water together in a small bowl until the cornstarch is dissolved into the water; pour into the mushroom mixture. Cook and stir until thickened and glistening. Transfer to a serving dish; garnish with the chile pepper and cilantro to serve. I really liked this and wouldn't change a thing next time. 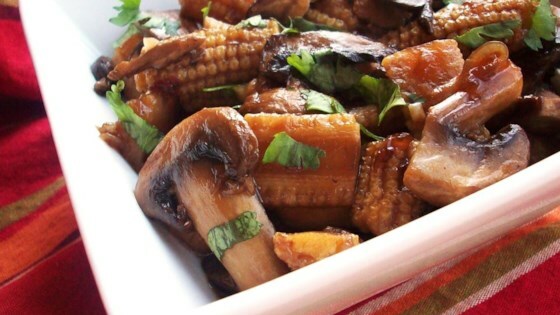 I did use can baby corn because that is all I have available here. Delicious. I had no fish sauce so substituted two parts soy to one part lime juice. Also had no chiles so I threw in a little crushed red pepper. Left out the cilantro. I made this as a side dish for the "Barbequed Thai-Style Chicken" recipe. It complemented it quite well!